It's only a matter of time until your garage door springs break. These components are vital to the proper operation of the system, as they are what supports the weight of the panels and counterbalances them. That's a fancy way of saying that the springs do all of the heavy lifting, which means that they are under a great deal of stress on a daily basis. This stress makes them very dangerous, as when they break they can whip around and cause severe lacerations. That's why you must never try to replace or adjust these components by yourself and instead have our professional technicians do it. Due to the high amount of tension these components are under, replacement is something that should be left to the experts. Our technicians have the skills and the experience needed to safely handle these units, and we started providing emergency spring replacement services for that very reason. We don't want to see you get hurt attempting dangerous DIY repairs. 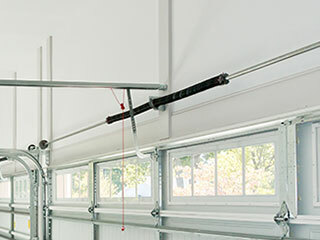 While we offer a wide range of garage door repair services, adjusting and replacing torsion and extension springs is definitely one of our main focus points. We are experts at safely handling both types, and we know just what kind of maintenance they require. As part of our regular service appointments, we'll make sure none of the coils are too deformed, that the door is perfectly balanced, and that the torsion springs (if your door uses this type) are well lubricated and able to work smoothly and silently. Broken spring replacement is a task that should only be performed by professionals. If you find yourself in need of assistance, don't hesitate to contact Garage Door Repair Santee and have our experts take care of the problem quickly and safely. Schedule an appointment today!